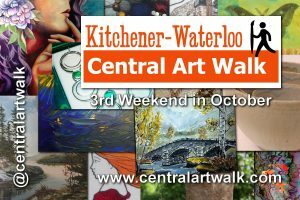 The Central Art Walk is a yearly studio tour and sale in the beautiful Kitchener neighbourhoods bounded by Park, Victoria, Weber, and Union streets. Come visit, and get a chance to see artists in their own studios, displaying fine art, jewelry, paintings, food, photography, pottery, glass, collage and fibre arts. Printed brochures are available at local coffee shops, art stores, galleries, theatres, and other great places for arts supporters.